Facebook comes to the aid of injured echidna – Northern Rivers Wildlife Carers Inc. Adapted from an article written by Chrisy Clay for the Ballina Shire Advocate. The social networking site, Facebook, has shown its value to local wildlife by helping to identify a badly injured echidna in need of aid. Last month a Northern Rivers Wildlife Carers’(NRWC) Facebook follower sent the organisation some photos of a young echidna they were seeing regularly in their backyard. 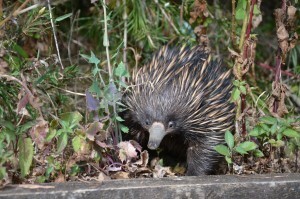 The echidna was unconcerned by the family’s attention and appeared normal. The photographs were forwarded to the NRWC echidna specialist who became concerned about the animal’s appearance and recent behaviour. A phone call later, and it was agreed that if the echidna was seen again that the McLeans Ridge family would attempt to rescue it and bring it into care for veterinary assessment. The next day the echidna was captured and when examined was found to have deep lacerations under both front legs. The wounds were infected and contained pieces of nylon netting. These wounds weren’t apparent in the photos. It appears the echidna had become entangled in the nylon netting which surrounded a neighbour’s vegetable garden and in trying to free itself had been severely injured. The echidna was transported to Currumbin Wildlife Hospital for specialist treatment and care, where it was immediately given pain relief and antibiotics. It’s unknown how long the echidna was injured before it was rescued but the specialist veterinarians believe it could have been up to a few weeks. Unfortunately the echidna survived only three days in intensive care at the Currumbin Wildlife Hospital before succumbing to infection. Although an incredibly sad rescue for those involved, the echidna would have suffered much more if it had not been rescued. Please remember that if you are using nylon netting, either for protecting fruit trees or gardens, ensure it has very small holes: so small you can’t push your finger through them. Only this small size will prevent wildlife from becoming entangled. The Northern Rivers Wildlife Carers recue many animals every year that have become trapped in backyard netting. Almost all of these animals suffer severe injuries like this echidna.